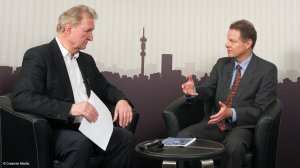 JOHANNESBURG (miningweekly.com) – London- and Botswana-listed Botswana Diamonds, which is funding diamond exploration on three sites in South Africa, expects to declare an inferred resource by year-end at its Thorny River project in Limpopo, which is located very close to the Marsfontein mine that had an astonishing three-and-a-half-day payback. The De Beers Southern Era Marsfontein joint venture of 1998 to 2000 had an average grade of 172 carats per hundred tonnes (cpht) and a diamond value of more than $200/ct – but it was only 0.4 ha in size. Now, Botswana Diamonds, using part of £868 576 raised two months ago through the issue of 79.48-million new ordinary shares on the London Aim, is investing in Thorny River as part of an earn-in transaction with the 28%-black empowered Vutomi, which has extensive prospects in South Africa. (Also watch attached Creamer Media video). The company raised a further £543 000 through a private placement of 43.44-million shares at 1.25p a share to directors’ families and investors in Ireland. Further, Botswana Diamonds chairperson John Teeling and directors James Finn and David Horgan subscribed for new shares at 1.25p a share to raise a further £60 000. The directors of the company previously worked with De Beers to develop the AK6 deposit in Botswana, which is now the Karowe mine. The company’s second area of exploration activity is in the North West province, close to Petra Diamonds' Helam mine, where the company recently found a small kimberlite pipe. The third area of exploration and the largest is in the Free State, where there are ten kimberlites across 40 000 ha of the Kimberley-Koffiefontein-Jagersfontein corridor. Work is currently focused chiefly on Thorny River, where the intention is to start work next year on the generation of an indicated resource followed by a prefeasibility study. “So, Thorny River is probably closest to commercial production,” Campbell told Mining Weekly Online. Its three exploration areas have very different kinds of diamond assortments. Focus in the Free State is on finding low-grade, high-value deposits that characterise the area, whereas the focus at Thorny River and the North West is on finding smaller kimberlites that have high grades and high diamond values. With more than 30 years of experience, 20 of them with De Beers, Campbell agrees with the widely held view that South Africa is significantly underexplored. 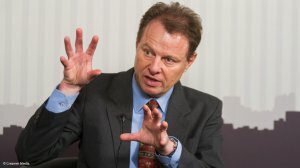 “There are vast swathes of South Africa that haven’t been looked at for 30, 40 or more years, and what is important is that every time there is a breakthrough in prospecting technology, there’s the opportunity to find a new mine,” he said, adding that when AK6 was found in 1969, it was seen to be low grade at 2.5 cpht and small at 2.5 ha, but the new geophysical surveys of the 1990s turned the 2.5 ha into 10 ha, and new drilling approaches took the grade from 2.5 cpht to 25 cpht. The use of third-generation technology is advocated to find additional opportunities. As reported by Mining Weekly Online earlier this month, the exploration programme of De Beers Consolidated Mines (DBCM) is grinding to a halt owing to the ongoing issues with South Africa’s Department of Minerals Resources (DMR). With the hold-up of as many as 54 prospecting licence applications for as long as two years as well as Mining Charter Three deal-breakers, DBCM is unlikely to continue budgeting between R30-million to R40-million a year for greenfields diamond exploration in South Africa. “The reason for that is that as much as we want to explore in South Africa, we don’t have any prospecting licences granted to us at the moment,” DBCM CEO Phillip Barton told Mining Weekly Online. DBCM has been in discussion with the DMR trying unsuccessfully to resolve some of the issues for some time. “I’m convinced that in conversation, in dialogue, in continuing our engagement, we’ll break that impasse and that we’ll go back to greenfields exploration because we need to find that next diamond mine, not just in De Beers, but in De Beers in South Africa,” Barton commented.